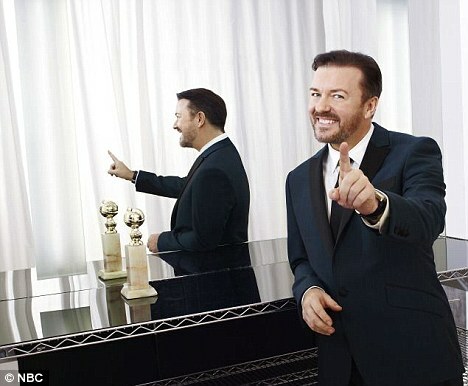 Golden Globes 2011 Recap – Those Choice Gervais Moments. Posted on January 15, 2012 by Big Red	in Funny Booty, TV Booty and tagged golden globes, golden globes 2011, golden globes 2012, nbc, ricky gervais, ricky gervais hosting golden globes 2012. We’re not massive fans of comedian Ricky Gervais, we do think he’s funny at times but certainly isn’t the chosen one who is single-handedly rewriting the rules of comedy for the modern age, as some of his ardent fans would have you believe. That being said we’re looking forward to watching him host this year’s Golden Globes following his stint roasting everyone in the room in 2011. We thought we’d remind you of the controversy Gervais created last year when he ruffled a few Hollywood feathers. We can only hope he does more of the same this evening, but with a seven second delay enforced on the live transmission by NBC it’s looking doubtful. ← UK Govt To Extradite Student To US Over Internet Piracy Claims.